A new investigation has concluded that 97 percent of the weapons used by the Islamic State were supplied illegally by the U.S. and Saudi Arabia. While the mainstream media opted to protect the United States government by treating anyone who dared to question the government’s role in the rise of ISIS as crazy conspiracy theorists, a new report is forcing the MSM to admit that those “conspiracies” were true all along. Now, mainstream media outlets such as Reuters and USA Today are suddenly reporting that the United States and its close ally, Saudi Arabia, were instrumental in supplying weapons and ammunition to ISIS. Both reports cite an investigation conducted by Conflict Armament Research (CAR), which looked at 40,000 items recovered from Islamic State militants between July 2014 and November 2017. The original study that Buzzfeed and other media are referencing comes from a UK-based independent weapons research organization called Conflict Armament Research (CAR) which has had a team of weapons and munitions experts on the ground in the Middle East for years examining arms and equipment recovered from ISIS and other terrorist groups in Iraq and Syria. Using serial numbers, crate shipping markings, and all available forensics data, the CAR experts began finding that as early as 2013 to 2014 much of the Islamic State’s advanced weapons systems as well as small arms were clearly sourced to the United States and the West. The study further reveals that in one notable instance, a weapons shipment of advanced missile systems switched hands from US intelligence to “moderate” Syrian groups to ISIS in only a two month time period. Though the report is now evoking shock and confusion among pundits, the same weapons research group has actually published similar findings and conclusions going years back into the Syrian conflict. For example, a previous 2014 Conflict Armament Research report found that Balkan origin anti-tank rockets recovered from ISIS fighters appeared identical to those shipped in 2013 to Syrian rebel forces as part of a CIA program. And CAR’s damning publications presenting such inconvenient empirical data have been consistent for years, yet were largely ignored and suppressed by analysts and mainstream media who were too busy cheerleading US support for Syrian “rebels” cast as romantic revolutionaries in their struggle to topple Assad and his secular nationalist government. Of course, it’s an old story if you’ve been reading Zero Hedge or the profusion of independent outlets that have long reported the truth about the covert “dirty war” in Syria since nearly the beginning. Even though it’s now suddenly acceptable and fashionable to admit – as does one recent BBC headline (“The Jihadis You Pay For”) – that the US and Saudi covert program in Syria fueled the rise of ISIS and various other al-Qaeda linked terror groups, it must be remembered that only a short time ago the mainstream media openly mocked analysts and writers who dared make the connection between the West’s massive covert Syrian rebel aid programs and the al-Qaeda insurgents who so clearly benefited. When news of the 2012 Defense Intelligence Agency report broke, which described what it called a “Salafist principality” or “an Islamic State” as a strategic asset or buffer in Syria that could be used by the Western coalition “in order to isolate the Syrian regime”, American media outlets dismissed what was labelled a “conspiracy theory” at the time in spite of the hard evidence of a US military intelligence report being made available. The Daily Beast for example mocked what it called “The ISIS Conspiracy Theory that Ate the Web” – describing those analyzing the Pentagon intelligence document as far-right and far-left loons. This occurred even as the document was taken very seriously and analyzed in-depth by some of the world’s foremost Middle East experts and investigative journalists in foreign outlets like the London Review of Books, The Guardian, Der Spiegal , as well as RT and Al Jazeera. And yet now once again “conspiracy theory” has been confirmed as “conspiracy fact”: Conflict Armament Research’s new report out this week is the result of a three-year ground investigation which compiled findings from 40,000 military items recovered from ISIS between the years 2014 and 2017. Its conclusions are scientific, exhaustive, and irrefutable. This is what enables Buzzfeed, USA Today, and others to report the bombshell findings yet continue to soft peddle the significance by emphasizing things like “weaknesses in oversight and regulation” while also highlighting the “accidental” nature of US-supplied missiles “ending up” in the hands of ISIS terrorists. A guided anti-tank missile ended up in the hands of ISIS terrorists less than two months after the US government purchased it in late 2015 — highlighting weaknesses in the oversight and regulation of America’s covert arms programs, according to information published Thursday by an arms monitoring group called Conflict Armament Research (CAR). Though the report says the missile was purchased by the US Army using a contractor, BuzzFeed News has learned that the real customer appears to have been the CIA.It was part of the spy agency’s top secret operation to arm rebels in Syria to fight the forces of Syrian President Bashar al-Assad. The missile ended up in the hands of ISIS fighters in Iraq, according to the report. The CIA declined to comment on the Obama-era program to back Syrian rebels, which was canceled by President Trump in July. The Pentagon did not provide information in time for publication. The missile is one piece of a critical puzzle that is being solved only now, with ISIS on the run: How did the vast terror group arm its war machine? CAR spent three years tracking ISIS weapons as they were recovered by Iraqi, Syrian, and Kurdish forces — and found that what happened to the missile was no aberration. Indeed, the terror group managed to divert “substantial quantities of anti-armour ammunition” from weapons provided to Syrian opposition forces by the US or Saudi Arabia. But some astute observers might notice the significance of the timeline related to the CIA purchase of one of the anti-tank missiles examined: “A guided anti-tank missile ended up in the hands of ISIS terrorists less than two months after the US government purchased it in late 2015.” As highlighted previously, the CAR team of experts had already documented the trend of CIA weapons delivered to the Syrian battlefield going to ISIS fighters as early as September of 2014. Beyond this 2014 study, a seemingly endless stream of articles going back years published in independent and international media have underscored the reality of ISIS growing and thriving because of Western and Gulf state covert weapons shipments. Thus General Flynn in the summer of 2015, speaking as recently retired military intelligence officer, warned in no uncertain terms that US-supplied weapons in Syria were going to ISIS, al-Qaeda, and other jihadists. This was so well known at the time that it could be openly stated by a retired high ranking official an a major international program. Flynn also said something similar to both Seymour Hersh and the New York Times in 2015. But what did the CIA and allied intelligence agencies do? 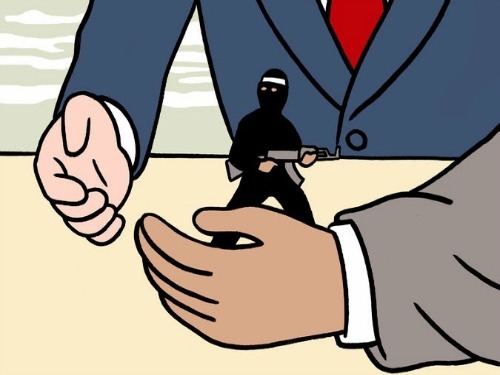 They continued arming the jihadist insurgency in Syria in their efforts to oust Assad. This was indeed “a willful decision” as Flynn affirmed and not mere “weaknesses in oversight and regulation” as Buzzfeed would have us believe.